This is the view I had through the window Monday from where I was lying in the living room just after sunset, in the late afternoon. This solstice moon had come up and I felt blessed, even though all I was doing was the Sudoku from the morning paper, and reading some emails from friends, thinking about what we’d have for supper. Singing, dancing, to drive the dark away. They lighted candles in the winter trees. They hung their homes with evergreens. They burned beseeching fires all night long to keep the year alive. And when that New Year’s sunshine blazed awake, they shouted, reveling. Through all the frosty ages you can hear them, echoing behind us — Listen! My role, 21 years ago, when I was in the chorus of our first Portland Revels, was to recite that poem, and I’ve always been fond of it. John Langstaff, the founder of the modern Boston Revels, was still alive then, and he came west those first years to play The Lord of the Dance. Noah, age 2, and his Mum, our grand-daughter Emily, were here this afternoon. He and I, downstairs getting out some books, came on the old leather satchel that contains a collection of recorders. He is the fifth generation now to have begun playing on these “pipes” as he called them. On December 27th, having our son Tom’s 60th birthday party right here in this house was very special. We’ve been together for very few of his birthdays since he’s been living in Pittsburgh all these years. There was a snowy one in London in 1978. And this one proved snowy, too, building up just enough white outdoors to heighten the sense of color and affection and warmth indoors. Dropbox, when we’d changed our password, sent a message that started with, “Hello, Buell.” The effect of having all this life behind you is that a small incident like this may recall another for a moment, full blown, always remembered, beloved. I was gardening, stooped, probably on my knees. Little Nick Adamy, three or so years old, whose dad, Ed, was helping us build an alteration to our kitchen, was playing, wandering here and there around the house. I heard over my shoulder, “What’r doing, Bee-oo?” The conversation that followed is gone, but “What’r doing, Bee-oo?” remains, used now and then with affection, enriching the present moment. 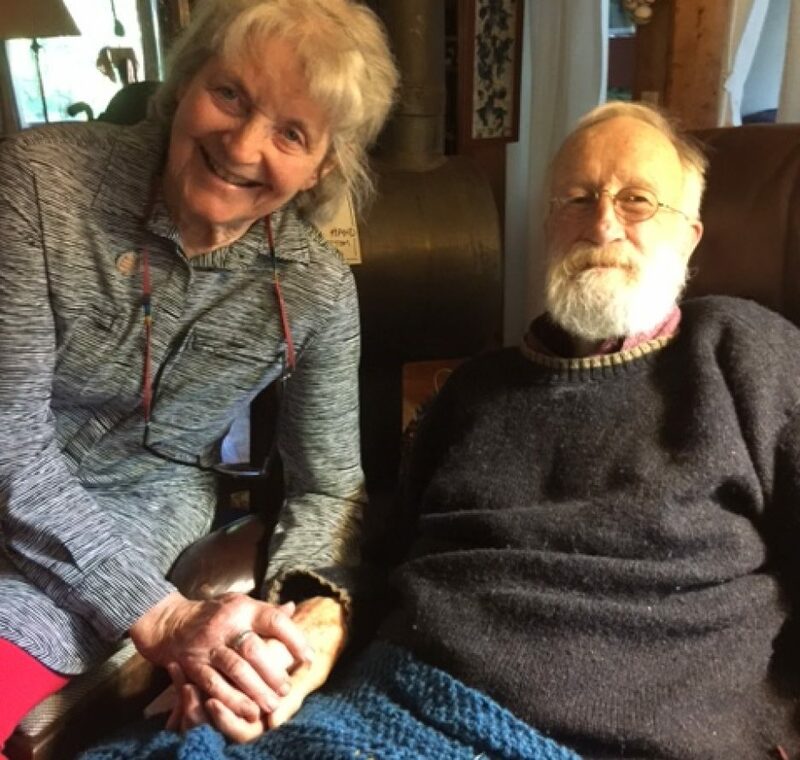 Ed had been a conscientious objector in WWII, had been part of the Black Mountain group that migrated to Oregon in the late 40s and become a mainstay of Catlin Gabel School. He was teaching all our children shop, and would continue into the next generation. Hester only recently used the skills she learned from Ed to build our Poetry Box. There’s something fundamentally mysterious and abstract about the international dateline in any circumstances, but when you’re in the middle of the ocean and don’t have to account to anybody for hundreds of miles in any direction, it seems a little silly to insist that it’s now Friday instead of Thursday when yesterday was Wednesday. But that’s alright if it makes the timekeepers happy. We float a lot in time as it is. One night on board ship at dinner we began listing on the back of the dessert menu all the roles Tom as an actor has played in his life. It started when he played the Mad Hatter at the age of about nine. His brother George was the Dormouse and his sister Becky was Alice. He was in plays all through the years at South Kent, then, after the Army, at Princeton, summer stock at Highfield on the Cape. Fellow actors, the directors, incidents involved in a certain production all came briefly to the surface as we went on. It was fun remembering the one time we acted together, the first year we were married. He played the husband and I played the living wife in Blythe Spirit, community Theatre in Northampton, Mass. It was a great success and we had a good time doing it. Then the American Theatre Company in Portland, a precursor of the Storefront Theater, came along in the late 1960s. And other productions under other directors – The Inquisitor in St. Joan, Prospero in Peter Fornara’s Tempest. He remembers the excitement at being given that role. It was his last and the only time he ever wept on stage. I’m sure that’s one reason I learned that passage by heart early on. The next morning, almost exactly at the point the Equator intersects the dateline, we had a sunrise after rain squalls in the night. The sun hurries through those first seconds after becoming visible, straight up, no lingering at the horizon. And setting, it does the same in reverse. Thinking of a summer solstice sunset in Hansville, how the sun coasts along as though reluctant to set, we are startled at the speed and the verticalness of this rising and the corresponding plunge. I wish we had more pictures of Tom in costume. We have him as Vandergelder in The Matchmaker, the play that opened the new stage at Portland State in the 80’s, and one from an article with the headline quoting him as saying “I am not a poet.” (Photo by Mike Lloyd) He always loved the sign on his door when he was doing a year of Administration: TCBuell, Acting Dean. A chance comment from a neighbor at table one night brought into sharp focus in my mind the town of Oban on the West coast of Scotland. There was no room in the hotel or the hostel. The two girls knew nothing of Scotland in September. They couldn’t know of the house parties, the shooting, the Hunt Balls, the number of lodges that lay vacant all year until September and then came alive. And they had not realized every hotel room and hostel bed would be reserved. They were by now 19, not well traveled. One of them, Joan, had spent the summer touring from England through Belgium and Switzerland to Italy and back to France as a member of the college Chamber Singer group. That group had departed, sailing on the Queen Elizabeth back to the U.S. Lee, the other girl, had just arrived in Europe, and the two had met up as planned, bought bicycles in London, put them on a train for Scotland, de-training in Stirling, and spending 10 days bicycling in the Highlands. At the Highland Games the next day, friendly and curious Highlanders spoke with the girls and told them how to get to Ben Cruachan. The photographs they took of each other at the top of that mountain are proof the girls arrived there, but the memory of the climb has vanished in time. Where they had made a picnic, how long the climb took, remain unknown. They had spent some time in the household of Richard Wimbush in Edinburgh. They know that because Lee took a picture of Joan playing in the sandbox with two of the littlest children. Later, Joan and her husband visited Richard Wimbush and his wife, by then retired from being Bishop of Argyll and the Isles. Years of sending Christmas cards back and forth had maintained that link. But lost is how they came to be there in the Wimbush household in the first place, nurtured, rested, lent clothing for their bike trip. The bicycles they had acquired had only three gears and in the Highlands the hills ore frequent, long and steep. So there were hours spent pushing bikes up hills. On one of those long series of hills, the girls were joined by a schoolmaster on holiday. He happened to know Scottish songs and was willing to sing them. Joan still has in her song collection the original songs she wrote out in the evening after they’d arrived at a hostel: Uist Tramping Song, Mhairi’s Wedding, Westering Home. In the upper right hand corner: “Learned from Christopher, Pass of Glencoe, September 13, 1952.” The staves are hand-drawn since there was no music paper handy, and the paper is yellowed, but the notes and the words are still clearly legible. So, sitting at table aboard Amsterdam in 2015, we talk with our neighbors and hear other conversations around us. We realize how most of us have stories we want to tell, how people have different ways of working the conversation around to where they’ll be able to fit their story in, feel justified in imposing it on others. It’s seldom as interesting or as beguiling to the group, many of whom don’t really listen, as it is to the tale-teller, but that’s alright. Perhaps some image, retained, will prompt one person to bring another good story into being. You begin to want to know more about some of the people you meet, having heard just a snippet, like. “…he decided he wanted to become a full-time glass-blower,” or, “I became a ghost-writer for..” There’s time. Because we’ve been on the road so many Christmases in the last 20 years, we’ve had few Christmas trees. We had a rainy one in the little town of Pucon in Chile, followed by a New Year’s Eve with Ian and Maggy Campbell at their farm B&B Rangipulli near Temuco. There were other guests, and we sang as I remember, delighted to learn a new round and sing familiar ones. Several years we were in Mexico, driving through territory all new to us, staying in small hotels as we went along. Often if you went to the church, you’d find a service going on, or people rehearsing. If I sat and drew for a while, in a square, almost surely a group of children would collect, start talking thinking I couldn’t understand, and then delighted as I was when I could actually converse. On Kauai, Tom’s brother and his wife joined us for a week. Being tropical is reminiscent for us because in 1955 we were in Bangkok, Tom teaching and starting provincial language centers for USIA, and two days after Christmas, our first son, (the current editor of this blog) was born. His first Christmas, in a different house, closer in to Bangkok’s center, we had palm leaves to put the presents on, and Amah gave him a rocking-horse she’d had made. This tree, the first white pine we’ve ever had, is sweet. It’s graceful and airy with plenty of open spaces for the candles. It was the ice storm last week that provided it for us, snapping it off right where I had guyed it, trying to keep it from leaning southward toward the sun. I was sad and wept when I saw it broken. We’d brought it west as a seedling from Camp Ramleh, the camp Tom’s father started in the ’30s in Rhode Island, one of those summers we drove East and back. But that same son, Tom, has resurrected it for us all, found the Christmas tree stand down in the barn, put it up where it just touches the ceiling in the living room. The only time you’d dare have candles is when you know the tree is green, almost still alive. And you don’t leave the room while they’re burning. You sit there, rapt with the magic, full of gratitude and glad for the tree that it has this way of ending. And the branch on the part of it that’s left in the woods will curve up to make a new top. At a gathering around our table Wednesday, I felt held, taken care of, almost cradled. I’d done very little of the work to bring it together, only getting the flowers, candles, tablecloth in place that afternoon. We were wine-tasting thanks to Mary Early’s bringing Denis Zeni of Leuta Winery in Cortona, Italy, into our world. And for many people at the table, it was the first time they had been here. But gradually, in various conversations, it emerged that poetry was one of the things we shared. Several people spoke of reading the poems in our Poetry Box when they walk their dogs along Penridge. Tom had found that his neighbor, the only person older than he at the table, had begun writing in the “winter of her life.” We gave Tom’s book to those who didn’t have it. And I found that while we were away, my cousin and a poet friend had been replenishing the contents of the Poetry Box for us. I am grateful! And in ice, which we had a-plenty Wednesday morning, the replenishing will be hazardous. I’ve recently been relearning “The Shortest Day” by Susan Cooper, getting ready for the Solstice. But I think I’ll add this Mary Oliver now. I love the way she uses the sounds and the metallic colors. When these two dear women were girls, just about 40 years ago, we and their parents combined with them to exchange households and schools for a term. It was done in such a way that they would both be at Lakeside in Seattle for a term, living with Andrea’s fa mily, and then the next term, they would both be at Catlin Gabel, in Portland, Oregon, living with us. Hester, the one on the right, our daughter, came in the middle between two boys, and she had been at Catlin Gabel since second grade. It was good to have that injection of another life, in both directions. I don’t remember exactly how it all got arranged, or many of the details of the way it worked out, but I do know that the happy effects of the exchange endure even today. Alan and Sally Black, Andrea’s parents, had been our friends since before any of us was married. The years of having small children, graduate school, jobs sometimes in different cities, had meant time together was sparse but regular. The bonds of friendship and love between more-than-sisters-and-brothers grew in ways we hardly could have expected, in both generations. Now, I feel a little like those “nurse trees” you see in the forests, not altogether disintegrating but clearly moving toward another plane, and watching the strong new life emerge. Beyond these two there come others. Hester is already a grandmother. The immediacy of this doesn’t so much mitigate the anguish at everything that is terrible, the deaths, the out-of-control feeling in a world where even gun control will not stop the terror, as it does to say we just have to understand that both exist, and that’s how it is. It is a knife edge we live on, and always has been, but we have a choice about how to perceive that edge.